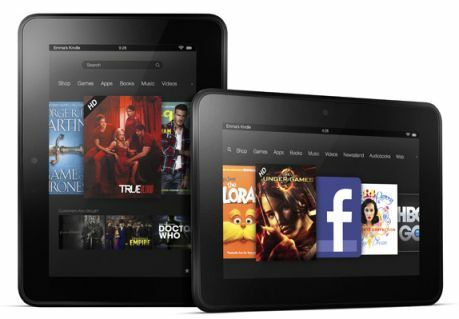 Amazon has launched the Kindle Fire HD 7-inch tablet in India, along with Kindle Fire HD 8.9 inch tablet. The Kindle Fire HD comes with a 7 inch IPS LCD capacitive touch with the resolution of 1280x720 pixels. It is powered by 1.2 GHz dual core processor with 1 GB of RAM. The tablet has 16 GB/32 GB internal memory and there is no external memory slot. It comes with Dolby audio with dual stereo speakers for immersive, virtual surround sound. It has a 1.3 MP front facing camera and Dual-band Wi-Fi connectivity with dual antennas. Amazon Kindle Fire HD 8.9 tablet has similar specs of 7 inch tablet but the display is 8.9 inch with the resolution of 1920X1200 pixels and powered by 1.5 GHz dual core processor.